Puppies are in need of much learning and guidance. One of the most important things to do is to socialize your puppy well in the critical early weeks and months. Realize that this is not just about letting puppy loose with people and dogs. There is more to socialization than that. You want to monitor within reason how they react to other people and dogs, and also to control the interactions with people and dogs so that your puppy feels safe with you. Ideally practicing training exercises is also a great way to socialize. For instance, practicing a sit before greeting a human friend or a canine friend. In reference to 2, do some research to find out what puppy play looks like. Talk to professionals about appropriate corrections and signals that dogs and puppies give each other. You want to find out when it's a good idea to step in, and when it's a good idea to let your puppy learn from other canines. Have your puppy on a leash and collar for safety, especially if you are outdoors and anywhere near traffic. If you are anywhere near traffic, be sure to have the handle of the leash well gripped in your hand. While socializing, an alternative to having your puppy off leash is simply having them drag the leash. That way you can easily intervene when necessary. Find as many outdoor and indoor places as you can to expose your puppy to new noises and sounds. Remember, the puppy most likely will not feel comfortable with them at first. It is the owner's job to guide the puppy confidently into and out of the experience so that the puppy feels more comfortable the next time. Do not coddle the puppy. It's OK to pet and reassure the puppy, but you don't want to block their learning and taking in of the experience either. Live in or near York Beach Maine? Here are some ideas that other puppy or dog owners can add to their socializing strategy. 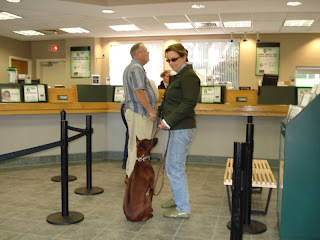 There are some very pet friendly banks in York Maine. 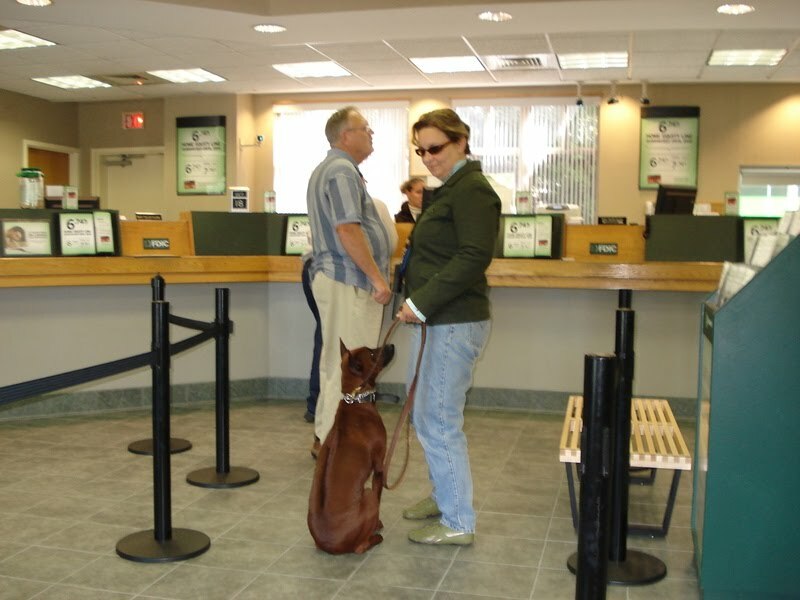 Kennebunk Savings Bank has not balked at customers bringing their dogs in. Be sure that they are ready to remain calm, not pee, and be enjoyable in the bank. Responsible pet ownership allows for these socializing opportunities to remain open to the dog owning public. 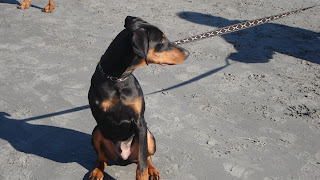 Long Sands Beach in York Maine is an excellent place to socialize your puppy. This is a place dogs (under control and ideally on leash if not fully trained) can get used to the sights and smells of other dogs, children, people, seagulls, water, wind, ET AL. 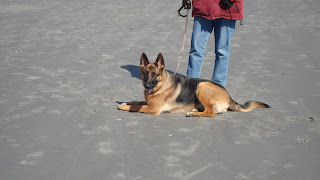 Beaches provide a lot of distraction and learning opportunities for dogs. Above is Bristol, who is still a puppy at just a little over 1 year old. 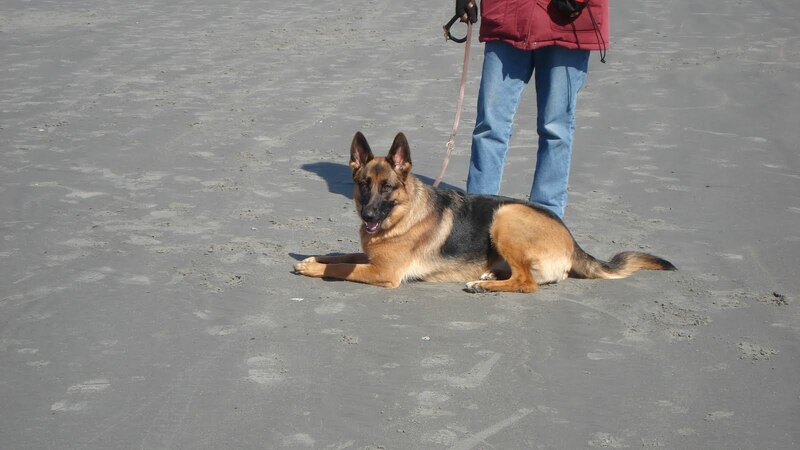 It is very hard for her to keep position among all the excitement around her on the beach. Restaurants, coffee places, or ice cream stands that allow dogs to be outside as owners and customers eat are fabulous places to socialize your puppy. Many pet supply places these days allow for pets to come in. Groomers, veterinarians, and other canine professionals normally welcome your pets as well, and may provide a cookie to make less pleasant visits less stressful in the future. Below is Boris at York Maine's local pet supply, Ann-imals. Finally, don't forget to socialize your puppy inside the home!! Puppies need to know that people you know, who may be strangers to the puppy, are allowed in and welcome when the owner says so. If you have a dog with a territorial or protective aspect to their behavior, this is a very important thing to do. If you are in doubt about whether you are doing any of this correctly, please call in a professional trainer to help!